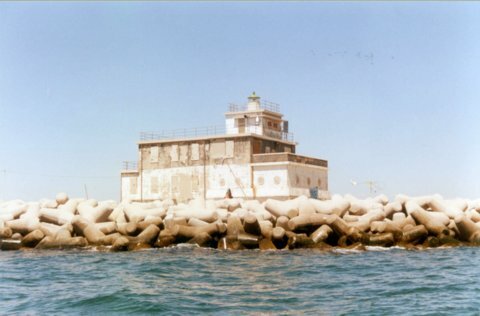 At Porto di Malamocco there are two lights: on the northern breakwater there is the black and white house with a green upper light and on the southern breakwater there is the other red tower. Walk to the southern tip of the Lido di Venezia (there are far too many small streets to list). From there you can see Faro di Malamocco on the near breakwater, the smaller red tower on the far breakwater.